Tuna to be banned from international trade? Two proposals to ban international trade of Atlantic bluefin tuna failed to pass at the recent meeting of CITES (U.N. Convention on International Trade in Endangered Species) held in Doha. Japanese people felt relieved to hear the news, because they did not want to loose the possibility to eat the delicious "toro"(*). The Japanese government did not find the total ban of tuna trade as a rational tool to address the problem of decrease in the bluefin tuna stock at the present stage. The necessary measures are to control the catch within the sustainable limit and administer it effectively in the framework of ICCAT (International Commission for the Conservation of Atlantic Tunas). "Toro" is fatty belly meat of tuna. For many Japanese people the confrontation with the Western countries concerning bluefin tuna added an additional stress on their nerve system. Diverse marine spices which we traditionally use for our life have become the targets of the Western offensive: whale, dolphin, tuna, eel and so on. The problem is very serious, because the code of human conduct in the present world is still essentially decided by the West with the overwhelming military and economic power as well as the missionary zeal to organize the world according to their conviction. Unfortunately, their culture and living style is so different from ours in Japan and we stay alone in defending us without a reliable ally. As everybody in the West knows, Japanese people have traditionally depended on rice and fish for nutrition, while Westerners have mainly consumed bread and livestock product such as milk and meat. To tell the truth, Japanese people were not such heavy fish eaters as the Western people might guess from their own volume of meat consumption (*). Until recently, sushi was not a daily food we could afford. Our food traditionally consisted of rice and vegetable, and only a small amount of fish, for example a few dried sardines for a day. Even rice was not abundant for poor people and lower grade cereals such as barley and millet were consumed instead. We used to take a large portion of necessary protein from grains, beans and other plants. During the occupation period after WWII the Japanese government requested the Supreme Commander for the Allied Powers in 1946 to allow them whaling for making up for the deficient protein intake by schoolchildren, because food supply was really very poor in those years. I was one of those children who could survive the hard time after the war thanks to whale meat. However, when Japan was allowed to participate in whaling with modern equipments, whale stock started to shrink as a result of overhunting by the traditional whaling countries and at the same time whale oil price dropped sharply. Western countries therefore lost their interest in whaling around 1960. This was the starting point of the contradiction of interests between us and Westerners who, according to our understanding, were indeed responsible for the drastic reduction of whale stock. As Japan is located in the area abundant in fishery resources, Japanese people could believe that the fishery resources were inexhaustible except for small enclosed sea areas such as Tokyo Bay. When the control of whaling became necessary, Japanese people thought that the situation was caused by Westerners who had been hunting huge whales around the world only to extract whale oil or to use their baleens for corset. (*) On the other hand, while Japanese people used all parts of whales, whale meat was in particular an important source of protein, as was symbolically shown in the case for schoolchildren mentioned above. Japanese people will never forget that Japan was forced by Admiral Perry of the US in 1853 to open its country in order to provide the American whaling vessels hunting near the Japanese territory with water and fuels. Disputes about dolphin hunting are also closely related to the issue of whaling. I feel that the difference of opinion is severer in this area, because Westerners have never used dolphin even as sources for their industry. From time to time brutal killings of dolphin by Japanese fishermen are broadcast in the West and incur anger against savage Japanese people. They insist, so far as I understand, that they cannot understand the barbarous act to kill and eat extremely intellectual marine mammals who can be even friends of humans. We think that horse and cattle are also intellectual and good friends of humans and cannot understand why Westerners distinguish between marine mammals and domestic animals. I hear that some people in the West say that it is permitted to eat livestock, because they are given by the God to the humans to raise and eat them. When European missionaries came to Japan at an earlier time, they found it extremely difficult to find farmers ready to offer them their cattle for eating, because cattle were at the time really partner and friend of Japanese farmers and it was impossible to kill and eat them. I strongly feel that the latter is more honest to the human feelings. Nowadays Europeans started to advocate "animal welfare", but I am not sure whether this idea is really meaningful for animals which are killed and eaten in any case. They should simply stop eating animals, if they feel pity for them. Otherwise, such an idea only satisfies the sentiments of the advocators. I would like to add a few more questions. First, if they say that only animals which are raised by humans may be killed and eaten, I wonder why they condemn the habit of eating dogs in some Far-Eastern countries. I don't know exactly how differently cattle and dog are handled in the Bible. But, notwithstanding the interpretation of sentences in Bible, the condemnation of dog-eating is nothing but a prejudice. Another question relates to hobby hunting. Why is it allowed to kill just for fun tens or maybe hundreds of thousands of deer, rabbits and other wild animals are killed every year? Another question concerns a country which fiercely criticizes whaling. The country kills uncountable number of wild camels which were artificially brought into the country and released into the nature without thinking the result. Only humans in the country are responsible for the existence of wild camels in the country. Why then do they have the right to slaughter them? Do they prefer animals to humans of different color? Sometimes I feel that the confrontation related to the handling of marine mammals really reflects the difference of our cultures. In particular when I see extreme activists violently interfere in the whale-searching, endanger the safety of the vessel and its crew and even injure them with chemicals and so on, I cannot but feel that they prefer animals they love to the humans of different color. When a government supported such criminals and threat Japan with sanction, I was almost sure that it latently maintains racial discrimination policy it used to have publicly till the 1970s and gave up apparently because it wanted to profit more effectively from the business with the Asian countries. Mr Rudd told Australia's Channel 7 television station this morning that Australia would "work with the Japanese to reduce, through negotiation, their current catch to zero". "If that fails - and I'm saying this very bluntly and very clearly on your programme today - if that fails then we will initiate that court action before the commencement of the whaling season in November 2010," Mr Rudd said. Source: MHLW (Ministry of Health, Labour and Welfare) - slightly different from the MAFF figures, but the general trend is identical. If they had not started criticizing Japan so emotionally and violently, Japan would have ceased whaling - including scientific whaling in the hope to resume commercial whaling - long time ago, because whaling was not sustainable as business already in the 1980s. But, now it is the symbol of our national pride. The government cannot simply stop it, though we suffer a great loss, because the population strongly supports the present policy. Any politician who might hint withdrawal from the present position would be caught in the crossfire from the great majority of the people. Can the increasing meat consumption solve the problems concerning fishery resources? As for meat eating, taboo disappeared when Japan opened the country in the mid 19th century, though it took rather long time to change the centuries lasting eating habit. 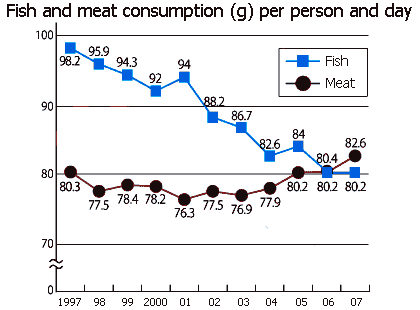 According to MAFF (Ministry of Agriculture, Forestry and Fisheries), fish consumption by the Japanese people has been declining recently and meat consumption finally surpassed fish consumption in 2006. 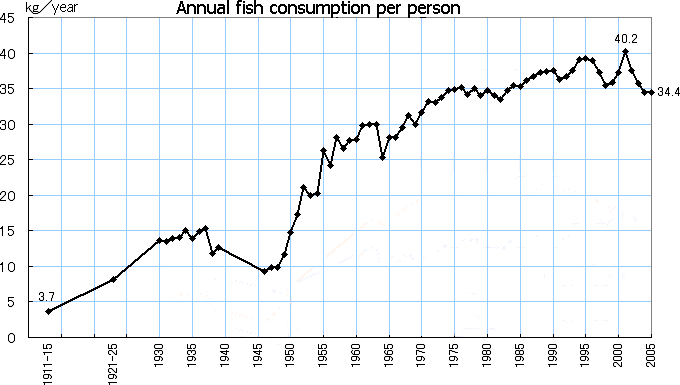 As this trend will certainly continue, we will eat less and less fish and we may not have the problems we have now. However, things might not develop so smoothly, if we see the issue more closely. First of all, younger people consume less fish. A reason for this is the difficulty of eating fish prepared in the traditional way. Some sort of training is necessary to eat fish with chopsticks, in order to sort out bones, fins and scales. In the affluent society where children are less disciplined, they hate to eat troublesome fishes such as sardine, mackerel and squids, though those fishes used to be abundant in the nearby seas of Japan. They are also fishes in the lower layer of food chain and their consumption would affect the environment to the lesser extent. Another factor is the change in the taste of Japanese people. Japanese people have gradually accustomed to the Western style diet with more fat and oil. Among fish meat, people nowadays prefer fatty parts. Therefore, Tuna and in particular "toro" (oily belly meat of tuna) is now very popular in Japan, though it was thrown away until a few decades ago because it was thought to be too fatty. Also the imported fishes such as Norwegian sermon and Atlantic bluefin tuna become more popular and they are eaten not much in the traditional way such as grilling and simmering, but such as smoking and Carpaccio. Though the total fish consumption will drop, the fish consumption will be concentrated on a few species which are also preferred in other countries and we will have to compete with other countries to secure supply of those fishes. Therefore, the danger of over-catch exists not only for bluefin tuna. We were so fool to try to export Japanese cuisine. The great mistake Japanese people and its government make in the culinary world is the efforts to popularize Japanese food in foreign countries. They thought it would be fine that foreigners eat Japanese cuisine, because it would promote their understanding of and sympathy for Japan and possibly benefit business. However, that was an illusion! Maybe, there was some emotional effects, but with respect to business, their trial was a total failure. Japanese cuisine did not give them more business chance, but foreigners who learned half way the Japanese cooking. The Japanese food experts are angry that the pseudo-Japanese foods are sold in many foreign Japanese restaurants where Asian, European and even Middle-Eastern cooks cook questionable Japanese foods. They try to give discipline and want to authorize overseas restaurants which offer "authentic" Japanese food. This is, however, simply nonsense and ridiculous. Who could profit from such an idea? No Japanese fishers, because they hardly export their catch to Europe because of complicated procedures related hygiene requirements and higher prices within Japan. But, these are trivial issues. The only and serious result from the popularization of Japanese food and Japanese style cuisine was the increase of fish consumption in foreign countries and severer competition in the world fish business. It is incredible that Europeans and Americans appreciate sushi as healthy diet food! In addition, our neighbors Chinese and Koreans drastically increase their fish consumption as their living standard levels up. Japanese have to compete with new consumers in the third world who are not so disciplined in catching fishes and indifferent to the world criticism. While competing with them in the fish markets, we have to strengthen our effort to control the fishery world wide, in line with what the Japanese government explained at Doha, so that the sustainable use of the fish stock will be made possible. Complete cultivation is a hope for the future. Whereas we are surrounded by bleak und tragic news, a piece of recent news pleased me a lot. It was reported that the trial towards the complete cultivation of blue fin tuna went on smoothly and we could eat completely cultivated bluefin tuna within a few years and that the complete cultivation of eel was made possible for the first time in the world by a Japanese research institute. As for the cultivation of tuna, the difficulty lies in the raising of fries and people have to decrease the mortality rate by among others finding more suitable feed. But, we have a very promising future. In case of eel it was more complicated, because eels lay eggs far from the coast somewhere in the depth of the sea. Until recently researchers could not identify the place for spawning and find eggs and fries. 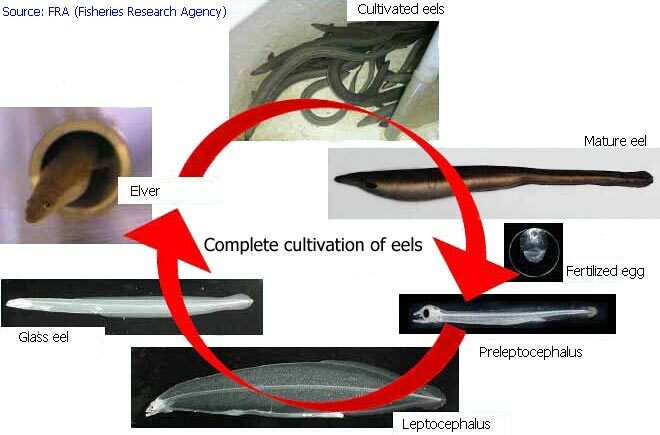 They tried to clarify the eel's life cycle step by step. The most difficult part was to find feed for newly born babies so that they can be raised to the size suitable for the conventional eel cultivation. About a month ago a piece of news was circulated that researchers found pre-leptocephalus only a few days after their birth and found in their stomach excreta of certain sea squirt. This is an epoch-making discovery, because the feed for newly born fries was the biggest question and obstacle to reduce the mortality rate of small fishes. Then, two days ago a state research center announced, it succeeded in realizing the complete cultivation of eels. 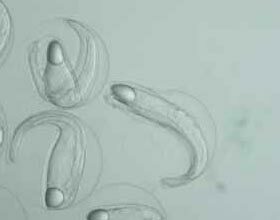 It could succeed in spawning of a female eel which were born in the center and about 100,000 fries were born a day after artificial insemination. Though eel fries to be raised in Japan come from the Asian stock, processed eels which are imported China mostly use fries taken in Europe. It is obvious that the eel cultivation in China and the consumption of cheep imported eels in Japan have caused the worsening of eel stock in the Atlantics. I hope that the development of technology for aquaculture could solve the problems we are facing now, so that we can continue to enjoy the delicacies in the future.